The Ottomans first encountered Jews in land they conquered from the Byzantine Empire. This group of Greek-speaking Jews was known as Romaniots. In time, the new Jewish groups became Ottoman subjects. Groups of Jewish people exiled from France during the reign of Sultan Murad II and the Ashkenazi Jews expelled by the Duke of Bavaria Louis IX in 1470 took refuge in the Ottoman Empire. Sultan Bayezid II accepted tens of thousands of Sephardic Jews escaping from Spain in 1492. They settled in various cities such as Salonika (Thessaloniki), Smyrna (İzmir) and Constantinople in particular. Likewise, groups of Jews who managed to escape massacres in Poland and Ukraine in 1660 settled in the Ottoman Empire, as well. 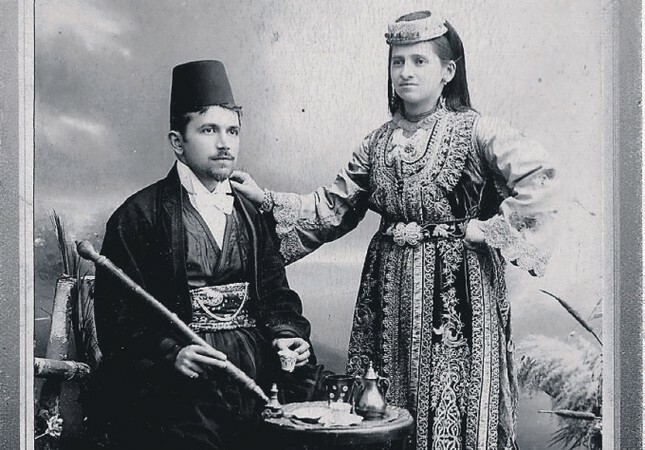 Around 90 percent of Ottoman Jews were of Sephardic origin and lived in cities, including Constantinople, Salonika, Smyrna, Edirne, Bursa, Jerusalem, Safed, Cairo, Ankara, Tokat and Amasya. During the reign of Süleyman the Magnificent, when Constantinople had a population of 500,000, the number of Ottoman Jews was around 40,000. In Salonika, the biggest Jewish city in the world at the time, Ottoman Jews constituted more than half of the population. Unfamiliar with the anti-Semitic movement, the Ottoman Empire was one of the few places in the world where Jews could live freely. In 19th century Europe, they lived in harsh conditions, often in closed quarters called ghettos, and were deprived freedom of religion, holding public office and even the right to live. They were also denied the rights to acquire property, get an education, travel, found printing houses and publishing newspapers. In the Austro-Hungarian Empire, one of the places in which Jews lived relatively freely, the minority was bestowed the rights to settle in cities, practice the arts and receive education at a wider variety of universities outside of Jesuit institutions. It is no wonder that these circumstances led to the French Revolution, which later led to the 1782 Tolerance Charter. However, such restrictions were never enforced by the Ottomans in the first place. Despite being oppressed by limited mobility across the Christian world, many Jews became rich through commerce and began to loan money to governments, accelerating the hostility of the goyim toward them. Although their social situation in Europe improved with the freedom movement in the 19th century, Jews could only take part in the educational, cultural and political aspects of life in Europe by relinquishing their Jewish identity through baptism and adopting Christian culture. However, they started to take part in world policies over time, especially due to the wealthy Jewish community in the Anglo-American world. Ottoman Jews faced many outside obstacles, mostly imposed by their Christians neighbors. Christians were hostile toward Jews because they felt that Jews had acted against Jesus Christ. This is the underlying drive behind all of the calamities Jews have faced through the centuries. As a result, Christians believed Jews added the blood of Christian children to their matzo, a traditional flatbread cooked during Passover. They often claimed that Jews abducted their children and put them in barrels of nails to harvest their blood. In truth, even the blood of a kosher animal, i.e., meat acceptable for consumption according to Judaism, is forbidden by Jewish laws. Devout Jews do not eat meat without washing it seven times. These stories about the barrels with nails are a common theme in many of the complaints submitted to Ottoman authorities of the time. After the disappearance of a Christian child in Damascus, the public claimed that the child was kidnapped by Jews and thrown into a barrel of needles. This claim led to the 1840 massacre and the intervention of European powers, paving the way for Lebanon's autonomy. Since Judaism does not use a Christian-style hierarchy, there were multiple chief rabbis who oversaw Ottoman Jews. Grouped on the basis of their origin, province and city, every parish was subjected to its own self-chosen chief rabbi, chosen and designated by decree from the center. Every parish had its own rabbi, synagogue, school, teacher, court, graveyard, hospital and newspaper. The rabbi was also the chief of the religious court, called a "beth din." He orchestrated and led ceremonies such as engagements, weddings, births, circumcisions, acceptances to the parish, funerals and sacrifices in addition to ruling over personal cases involving family and inheritance law. They were also responsible for collecting taxes for the government. As it was the case for them everywhere else in the world, Jews were involved in commerce in the Ottoman Empire as well. They were so successful that they began providing loans to the Ottoman palace in the 16th century. Through these loans, Ottoman Jews gained enough power to enter political authority. In 1844, Jews constituted 170,000 of the total 35,350,000 Ottoman population. In 1905, when the total population of the Ottoman Empire was 20.9 million, the number of Jews was 256,000 and, when the population decreased to 18.5 million in 1914, 187,000 of them were Jews. At the beginning of the 20th century, 1.1 percent of the total population was Jewish. The change in population is related to various territory losses and migrations. The Regulation of Rabbinate was published in 1865, and a democratic structure was introduced to the Jewish community that allowed citizens to have a say in the matters of the congregation as much as the religious men. Ottoman Christians were strongly opposed to giving Jews similar legal status as other minorities in the empire. There were even rumors that Greeks reacted to the case saying: "Shame on the Ottoman government! They consider us equal to the Jews. We consented to the supremacy of Islam!" as it was the general inclination of Ottoman Christians to look down on Jews. Although the majority of non-Muslims in the Ottoman Empire were supported by European empires and used as a means of oppression against the Ottoman government in the 19th century, this was not the case for the Jewish community. However, the stream of Zionism filtering in from Europe during that century caused a big calamity for the Ottoman Empire. Zionists, a group of Jews who wanted to found a government in Palestine, had considerable moral and financial support. Regarding Sultan Abdülhamid II as threat, they cooperated with the Young Turks, the group that aimed to overthrow the sultan. After the dethronement of Abdülhamid II, permission was given for the migration of Jews to Palestine. The most prominent financier and mentor of the Committee of Union and Progress (CUP), which seized the government in 1908, was a Jewish banker of Italian origin from Salonica, Emmanuel Carasso. When Greeks, who had held a privileged status up until then, fell into disfavor after the Constantinople massacre of 1821 targetting Greeks, Jews were hoping for a second chance. However, with their art facilities scattered around Anatolia, Armenians came in first thanks to their capital surplus. As a result of the Jewish lobby's recommendations, the Young Turks government removed Armenians from Anatolia in 1915. Hence, the economy of the country was left in the hands of Jewish capital. Carasso, who was a part of the committee that informed Abdülhamid II of his dethronement, was the closest confidant of Talat Pasha, the figure responsible for the deportation law. In fact, when Talat Pasha escaped abroad in 1918, he entrusted his entire estate to Carasso. To take an active role in the foundation of the Ankara government, Carasso returned to his homeland before his death. After the foundation of the Republic, Jews were victim to various pogroms. They faced problems rooted in the anti-Semitic policies of the 1940s. With the 1942 capital tax, a considerable amount of Jewish capital was extracted and nationalized. Most Jews in the new Republic fled to Israel, which was founded in 1948. At the moment, approximately 50,000 Jews remain in Turkey.